Solid heavy polished brass ship's bell on over-hang bracket. Great tone for a small bell. Cotton rope halyard. 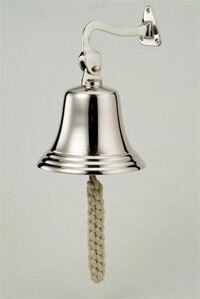 Size -4"
Solid Brass Nickel Finish Fog Bell -5-1/2"
Solid Brass Nickel Finish ships bell. A high quality ships bell that will keep it's luster for many years. Meets USGC requirement for boats under 12 meters. 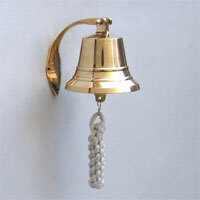 Solid Heavy Brass Rope Bell - 14". Solid Heavy Gage Brass Rope Ships bell. 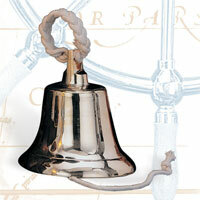 A high quality ships bell made of professional grade brass that will last almost forever. 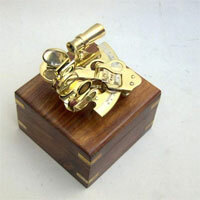 Solid Brass Sextant - 8"
Solid brass working sextant comes in a solid oak box with brass inserts. Precision calibrations with working site-glass. Where would we be without the sextant? 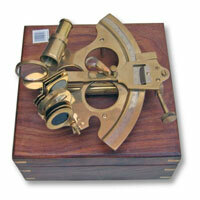 Solid Brass Sextant - 6"
Solid brass working sextant comes in solid oak box with brass inserts. Has full working parts and calibrations. 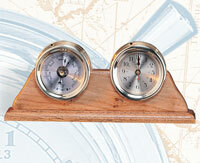 Our most popular sextant. 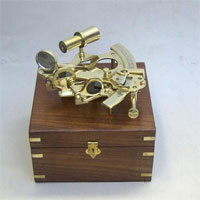 Size: 6"
Solid Brass Sextant - 4"
Solid brass working sextant comes in solid oak box with brass inserts. An excellent gift for the sea-faring enthusiast. Where would we be without the sextant? 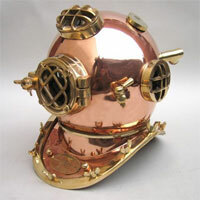 Solid Copper Antique Finish US Navy MK V Helmet Solid copper diver's helmet with an antique finish that gives the look of much use. Brass trim, glass portholes and name plate. 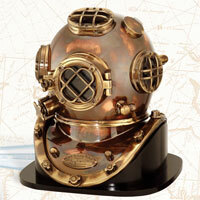 Authentic Mark "V" Jules Verne style diver's helmet full size. Polished solid copper with brass trim and name plate. Size: 18" tall. 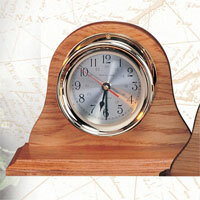 Solid polished brass desk clock and barometer on mahogany base. 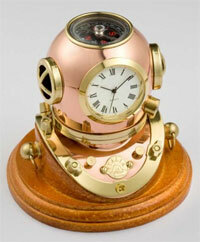 24 hour marine time, barometer gives precise bmp. Factory coated. Base: 23.5" x 9.5" high. 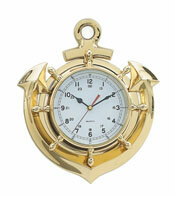 Solid Brass Captain's Desk Clock- 7.5"
Solid polished brass Captain's Desk clock on mahogany base. Quartz movement with 24 hour marine time. Factory coated for lasting shine. Base: 12" x 8-1/2" high. 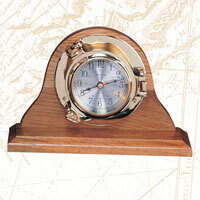 Solid polished brass Captain's Porthole Desk clock on mahogany base. Quartz movement with 24 hour marine time. Factory coated for lasting shine. Solid Brass Ships Telegraph - 39"
Highly polished solid brass large size ships telegraph with mahogany handles. Unit has hand painted authentic dials on both sides. Measures - 39" tall - precision made. 4-Porthole Weather Station on Oak base. 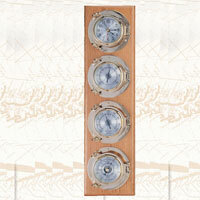 The admiral's four solid brass precision instruments on hardwood oak base. Clock, barometer, hygrometer, thermometer. Factory coated for lasting shine. 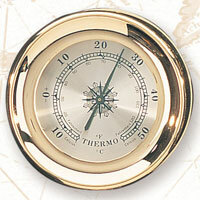 Instruments: 4-1/2"
Solid Brass Precision Porthole Weather Station on Oak base. Two solid brass precision porthole instruments on hardwood oak base. Clock and Barometer factory coated for lasting shine . 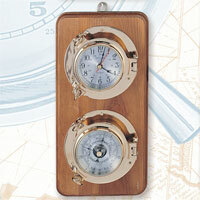 Solid Brass Captain's Barometer. 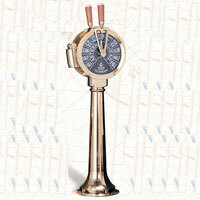 Solid highly polished brass Captain's Barometer. Gives accurate measurements in inches and mill bars. Factory coated for lasting shine. An essential piece for every boat & ship Measures - 6"
Highly polished heavy brass is factory coated for lasting shine. 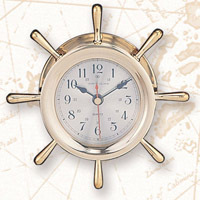 Clock gives 24 hour marine time in the shape of a ships wheel. 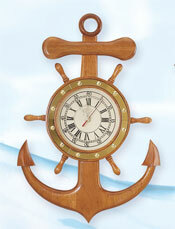 Great item for every ship, boat or serious nautical decor. Size: 6-1/2"
Klikk på bildet for å se flere kanon-modeller.